Rodents are out of control in California. Not only are they a nuisance to farmers, they are damaging levees, earth dams and other flood control channels. Until now county governments have been dealing with the pests using rat poison or rodenticide. The problem with poison is it travels up the food chain, killing owls, coyotes, bobcats and even endangered mountain lions, who eat the rodents. 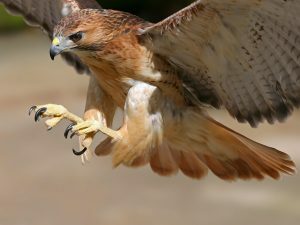 In order to solve the problem, Ventura County conducted a study to see if increasing the population of predator birds such as hawks and owls could be more effective at rodent control than poison. Over the course of 17 months, the country released hawks and owls into highly populated rodent areas. The birds reduced burrowing damage by 50 percent more than the anticoagulant rodenticides. The results prompted the Ventura County Board of Supervisors to order all county agencies to discontinue the use of rodenticides and other poisons on public lands. Farmers and gardeners can attract birds of prey to their property by providing nesting zones, tree cover, perches and water and by keeping dogs and noisy people out of the area. Read Rachel Carson’s book “Silent Spring” and use nature’s gifts, not chemicals! Rachel Carson’s anti-DDT fight killed millions of humans in Africa with malaria. Stop using rat poison as this also kills other animals. Hawks are more effective. I’m having a really hard time believing that they can eradicate prairie dogs to the point of extinction. I do realize poison is a problem but they’re has to be a better way than just birds. Do the raptors leave small livestock like chickens and ducks alone? We have hawks that come and nest in trees near us. We also have crows that try as hard as they can to kill the baby/young hawks. I found a young hawk dead on the ground a few months ago. Not a mark on it. My husband told me that the crows don’t eat them, they just want to kill them. True or not, I don’t know.